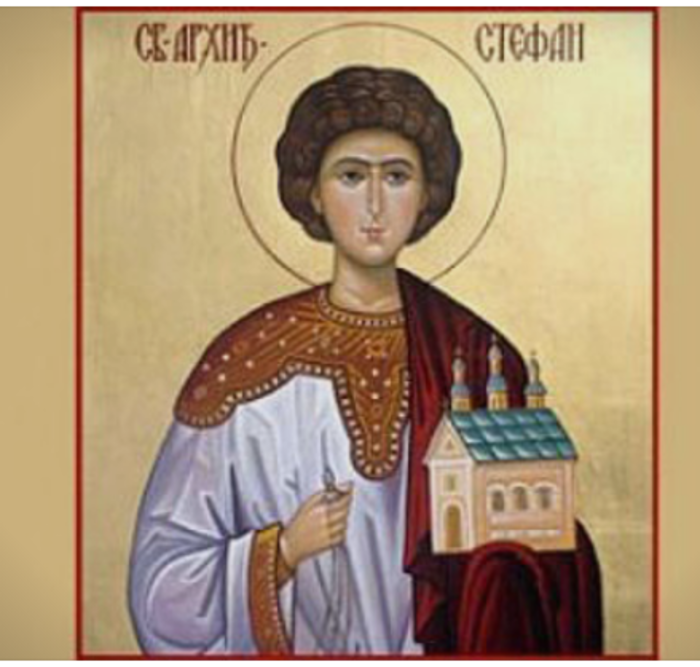 On the 3rd day of Orthodox Christmas, is celebrated the feast of St.Stefan (Stephen) who first gave his life because of faith in Jesus. He is considered a protector of old and sick. Today Stefan, Stefanija, Stevo, Stevanka etc. celebrate their nameday. The Holy Protomartyr and Archdeacon Stephen was the eldest of the seven deacons, appointed by the Apostles themselves, and therefore he is called “archdeacon.” He was the first Christian martyr, and he suffered for Christ when he was about thirty. In the words of Asterias, he was “the starting point of the martyrs, the instructor of suffering for Christ, the foundation of righteous confession, since Stephen was the first to shed his blood for the Gospel.” Filled with the Holy Spirit, Saint Stephen preached Christianity and defeated Jewish teachers of the Law in debate. The Jews maligned Saint Stephen, saying that he had uttered blasphemy against God and against Moses. Saint Stephen came before the Sanhedrin and the High Priest to answer these charges. He gave a fiery speech, in which he recounted the history of the Jewish nation, and denounced the Jews for persecuting the prophets, and also for executing the promised Messiah, Jesus Christ (Acts ch. 7). During his speech, Saint Stephen suddenly saw the heavens opened and Jesus Christ standing at the right hand of God. The Jews shouted and covered their ears, and rushed at him. They dragged him out of the city and stoned him, but the holy martyr prayed for his murderers. Far off on the heights stood the Mother of God with the holy Apostle John the Theologian, and She prayed fervently for the martyr. Before his death Saint Stephen said, “Lord Jesus, receive my spirit. O Lord, lay not this sin to their charge.” Then he joyfully gave up his pure soul to Christ. The body of the holy Protomartyr Stephen, left to be eaten by beasts, was secretly taken up by the Jewish teacher Gamaliel and his son Habib, who buried Stephen on his estate. They both believed in Christ, and later received holy Baptism.